Nothing is more annoying than a newly married couple, giggling at the front desk of the Aer Lingus first class lounge, a twinkle in his eye, a flash of her sparkler, and with eloquent charming persuasions such as "Ah, yerra, g'waan", who could resist.... contacting airport security. With the promise of 'Sure, we'll only be a minute, sure' we were waved into the world of free pretzels and international newspapers, ooohhh how the other half lives! Panic Stations O'Reilly, the place was jammers! Through a series of Chinese whispers, and I literally mean a group of elderly Chinese men whispering, we used our broken mandarin (which Dom had managed to secure from the first class fruit bowl) to determine that there had been some sort of hold up – sharpest knives in the drawer. There seemed to be only one computer working, so everyone had to hand over their passport to Random Bloke No 1 who passed them to Random Bloke No 2 who disappeared into a prefab chalet where the one working computer/forgery machine resided. After the fresh copies were offloaded onto the black market, Random Bloke No 3 emerged and passed back the passports through the uber hi-tech method of bellowing people's names. Sometimes he'd shout first names, sometimes he'd shout surnames, sometimes he'd twist and shout. At the call of son of Ali, (also known as 'Alison'), much to Dom's shock, I started digging my way through the crowd roaring 'It's me, I'm Alison'! I had spotted my battered green passport cover and knew that 'Shouting Random Bloke No 3' (aka Lulu) had latched on to my middle name and was singing my song. 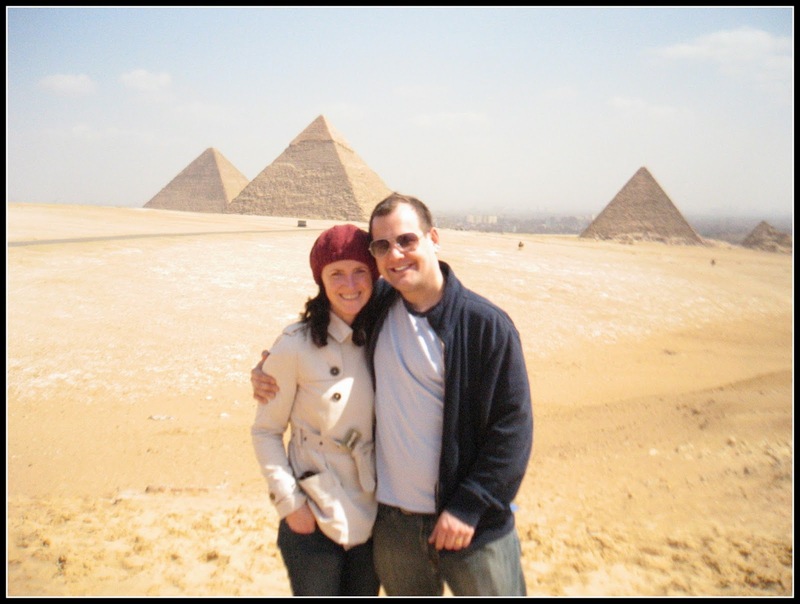 It wasn't long before Dom and his new bride 'Alison' were winging their way to the gorgeous Grand Hyatt hotel in Cairo. Upon arrival we were dying for some grub, feeling incredibly unadventurous and knowing we would embarrass some of our die-hard "I ate maggots with the pygmies and rumba'd with Castro" well-traveled friends, we sauntered into the Hard Rock Cafe (the shaaaame). To enter the premises, you had to pass through a metal detector, which are very common place since the attack on tourist sites in 2005. This metal detector however was not turned on (which also seemed common place) so merely served as a decorative metal arch. This 'arch' was manned by a very large moustachioed blob. Upon passing through such arch, said blob asked for a tip. This scenario of people asking for tips for doing absolutely nothing would happen at every turn. 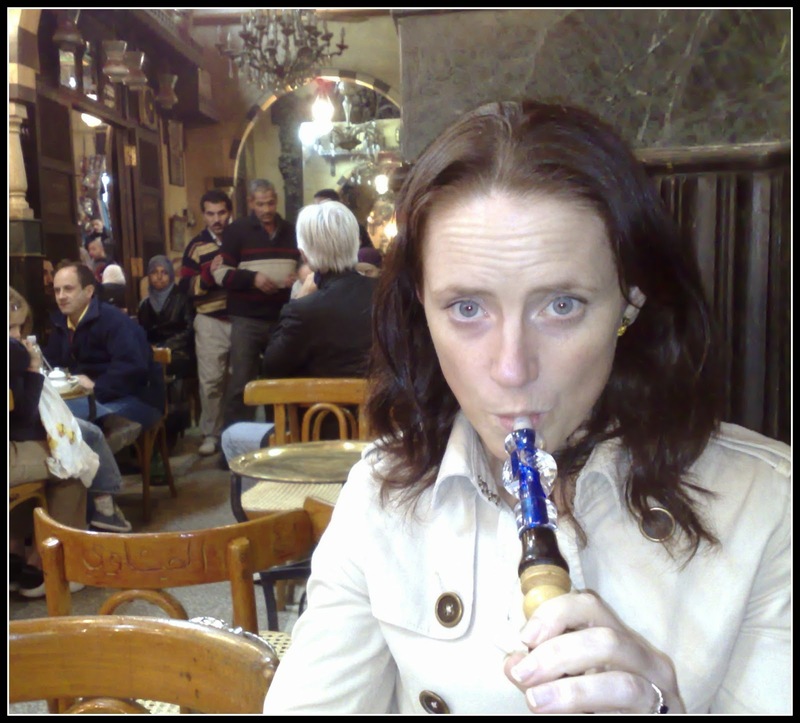 In Egypt this type of tipping is known as 'baksheesh', we have a similar sounding word for it in Ireland. According to our guide (yes we had a personal guide, it was honeymoon time, no time for backpacks, haggling with hoodlums, and travelling by tuktuks – although that does have a charm of its own, but you usually have to hock the charm bracelet along the way, ah good times). Back to the guide, he informed us that there were 7 million cars in Cairo, no set lanes per se, just pick a side of the road and try and stick to it, traffic lights – a few for show, but they're merely a suggestion. When Dom enquired as to where his seatbelt was the guide guffawed "Seatbelt! You don't need a seatbelt, this is Cairo baby!" (Ok, he didn't say 'baby' but he will in the movie version). 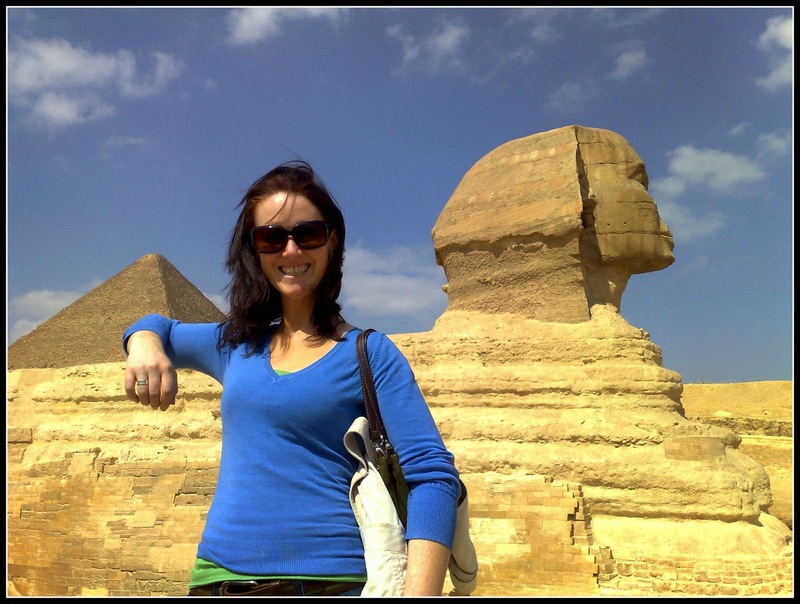 Our guide for the Pyramids was a double for the 1970s singer Nana Mouskouri, songs aside, she explained the reason behind the half built basic housing you pass as you head only 10 miles outside Cairo to the Pyramids. These half built houses form a sprawling decrepit 'guard of honour' leading you to the Great Pyramids. They remain half built because the government will tax any house that is a completed unit, so poorer families leave the houses unbuilt to avoid the tax. The poor sewage systems, that such slum dwellings engender, threatens the very existence of the country's main tourist trap. To put it simply, bad drainage and irrigation are causing the pyramids and the sphinx to sink into the sand. The Great Pyramid truly is a wonder of the world, it is colossal, far larger than I had ever imagined. It's very humbling to stand in the shadow of its greatness and picture it as it would have been, encased in highly polished white limestone and capped in pure gold. It is fascinating to think that within the Great Pyramid lies a secret chamber that even Harry Potter hasn't broken into. Always interested in other people's houses, into the small pyramid we went. You walk down a narrow gangplank into the dark tunnel; you're forced to crouch until you're flossing your teeth with the laces on your shoes. Your breathing becomes extremely laboured as the oxygen supply slowly runs out. Heaven forbid you should meet, as we did, a hot and sweaty American hyperventilating as he struggled to escape from the tunnel, there isn't room for two way traffic, (that never stopped the Egyptians), you're slammed against walls or worse get rear ended, literally, cheek to cheek in a whole new way. Before asphyxiating you get to appreciate all the glorious colours and decoration that have survived in patches on the walls in these kings' tombs. The Sphinx is smaller than you'd think (probably because of the sinking), yet spellbinding, very hard to tear your eyes from it. The thoughts of it questioning ancient travelers with riddles and killing those unable to answer them, seems quite obviously a fact not a myth. The crying shame is turning your back to the pyramids and sphinx and seeing only 200 meters away a Pizza Hut...and then realising it's closed. No, no, I'm kidding, the shame is that it exists, not that it's closed, honest. This is a must-see on a visit to Cairo, the bazaar has been in existence for at least 500 years. We actually stumbled across it having first taken some wrong turns and experienced the 'real' Cairo. The souq reminds me of images from Tintin books I read as a child (yeah, I'm that nerdy), lots of hustling and bustling, narrow cobbled lanes bordered by small shop fronts adorned by large sacks of colourful spices, men in fez hats smoking shisha pipes, sellers hawking strong perfume with opening gambits gleaned from conversations with many British tourists, such as 'lovely jubbly, you know it makes sense'. We stopped into Fishawy's Coffee Shop, it's 24 hours and claims not to have closed its doors once in 200 years! Might explain why it took 20 years to get served, worth the wait though. The Egyptian museum in Cairo is a museum within a museum, glass cabinets line the walls with hand written scant information plaques, over 120,000 items cram the cabinets. Carvings, sculptures, sarcophagi, mummies, fill every inch of space. As I am an archaeologist wannabee, this is heaven, Dom and I spent our time ricocheting back and forth to each other like a pinball machine to announce our latest discovery. The raison d'être for my desire to be an archaeologist lay in wait for me in this museum – Tutankahnmun's treasures, including the boy king's death mask we all know so well. The man himself lay in mummified form in his resting place in the Valley of the Kings. Before we left Cairo we headed to the Four Season hotel for one drink (trust me, with those prices, it will just be the one... between you). It's got great views and the bar is called 'The Bar', the lazy arrogance, fantastic. We trained it to Aswan, on the train I asked for a chicken dish, I was given a small black slimey portion of God knows what. We decided to check out the train bar where a group of Russians where crushing beers and having the time of their lives. Just watching them helped me get over the dark chicken incident. Upon arrival in Aswan we boarded our boat which was exactly as I hoped, Miss Marple playing bridge with Hercule Poirot, it had Death on the Nile written all over it (with a hot tub twist). Being honeymooners we commandeered the hot tub and had the cocktails coming in a loop. 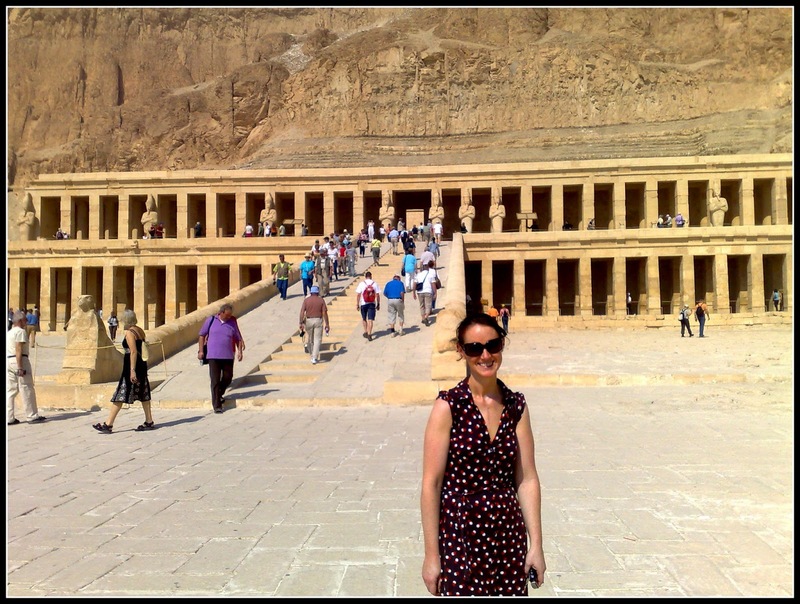 We visited the Temple of Philae which was impressive and included ancient graffiti! 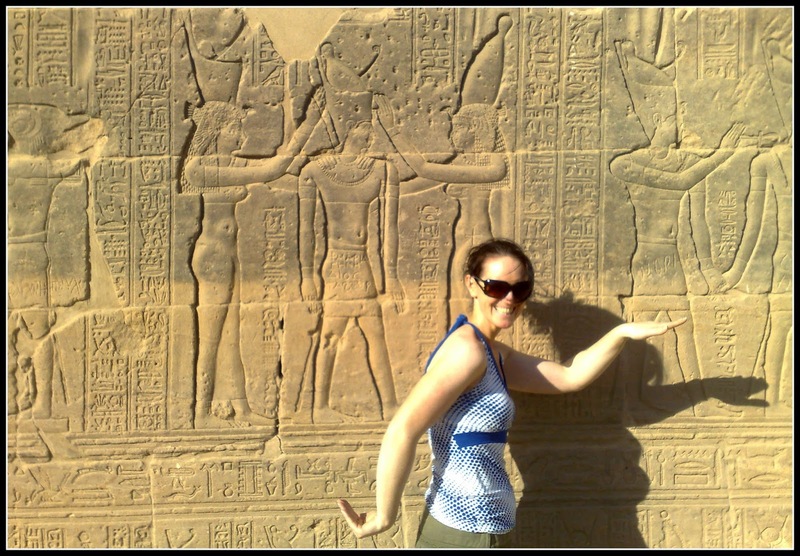 It was while leaving the Temple of Horus in Edfu that I met my biggest fan. Unable to resist a look at local trinkets, I took Dom along as my personal Chancellor of the Exchequer and general reality check, "No, I don't a think a mummy's casket could replace our bath". We battled through the persistent hagglers whose main pitch was to pester Dom to buy something for 'the pretty lady' (that role was played to great reviews by yours truly). While passing one particular stall, my cursory glance locked eyes with one particular hawker who nearly choked on his kebab as his eyes popped out of his head. He vaulted over his array of made-in-china miniature pyramids to cut off our path. Going against the formula he completely ignored Dom, stood an inch from my face and shrieked 'It's SHAKIRA'. Although I bear absolutely no resemblance to the Colombian songstress (I wish! ), aside from the occasional dodgy barnet, I was tempted to break into her famous "Oh baby, when you talk like that you make a woman go wild" whilst belly dancing into his shop, purchasing all the contents as I went. The comparison was farfetched (to say the least) but it would have been churlish of me to ignore such a compliment so I added a shimmy to my sass and boarded the bus. Raiders of the Lost Ark, Discovery Channel marathon weekends devoted to Howard Carter and Lord Carnarvon, and many a heartfelt philosophical debate in college where I insisted beneath my preppy exterior beated the heart of an Egyptologist, did not prepare me for the lifelong dream of visiting King Tutenkahnmuns tomb. It sends chills down your spine walking through the narrow tunnel. A large German tourist in front of us decided to break the rules and take photographs as we marched in the grey darkness. In something straight out of a movie, a guardian of the tomb stepped out of the shadows dressed in an ancient tunic and shouted in Arabic at the tourist whilst wrestling the camera from his hands. In a deft move that belied his ancient dress he deleted the tourist's photos and ejected him from the line. All of a sudden, the weight of history and mystery fell upon the remaining tourists as we continued stepping in dumbstruck unified silence. When you enter the tomb a man of about 200 years beckons you in, he leans against his staff and smiles a toothless grin. He is the protector of the tomb and I like to think hasn't left his kings side since the tomb was first sealed. Having been to the museum in Cairo I knew all the contents would be missing from the tomb so you had to rely heavily on your imagination as to what it would have looked like. In the corner, no bigger than a child, lies the black and withered mummified remains of King Tut. It was truly remarkable to look at the shrunken skull and think how universally famous this little man is. At an ungodly hour, we were ripped from our beds. We pattered down the gangplank to be greeted by a camera crew, the bright lighting burnt our retinas. Oh God, I thought, enough with the Shakira thing, then I remembered we had decided on a dawn hot air balloon ride. We looked at each other in agreed silence; I would snap my Shakira snake hips at the lighting man while Dom body slammed the camera man into the Nile. But before we knew it we were sucking tea on a felucca (Egyptian sail boat) making polite conversation with other kidnappees. The early morning was well worth it; we blasted off into the atmosphere just as the sun was rising over the valleys, and sailed over the magnificent Temple of Karnak. It was spectacular and the memory would always stay with me.